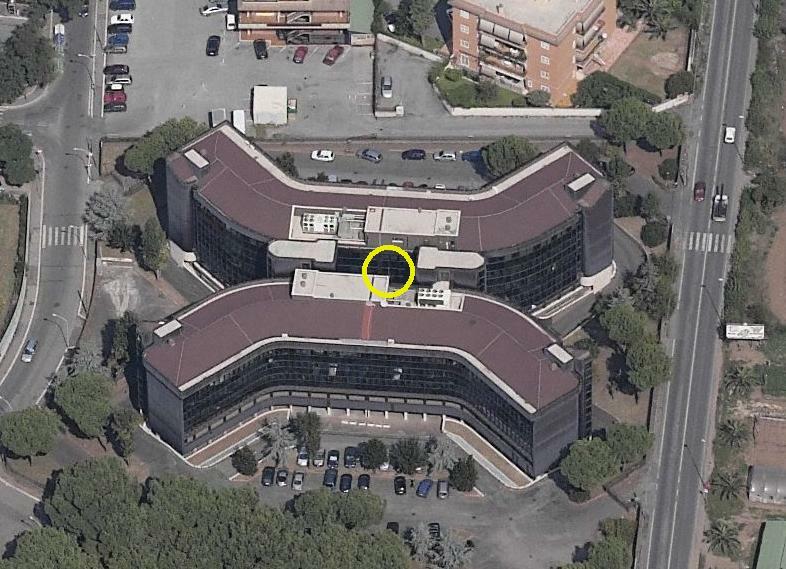 The I0JX/B beacons operate from my work QTH which is located in the eastern part of Rome within the beltway (having a diameter of roughly 20 km), as shown in map below. Picture below shows a more detailed map of the JN61HV square. 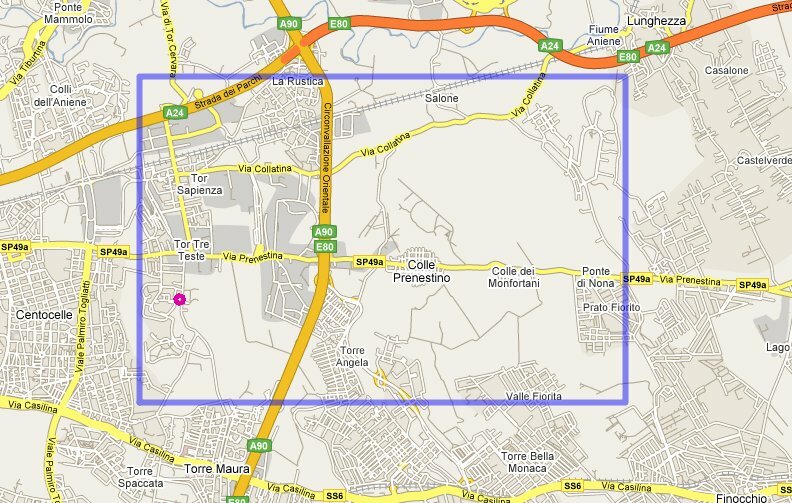 The beacons location is identified by a purple dot. The Rome beacon, operating on 70.088 MHz, was firstly activated on July 12th 2007, the very day in which the Italian amateurs were initially authorized to utilize the 70-MHz band, until year end. The beacon was re-activated on April 30th 2008 until year end, and once again on May 25th 2010. Since November 1st 2010 it is dormant and will remain so until when a new authorization will be issued. * Message: "I0JX/B I0JX/B I0JX/B JN61HV I0JX/B I0JX/B I0JX/B JN61HV ROMA QSL.NET/I0JX"
* Equipment: home made (by I0JX). FSK-shifted crystal oscillator at 35.044 MHz followed by a times-2 multiplier, then by two driver stages, and finally by a power amplifier. A feedback circuit keeps RF output power constant independently of temperature variations and components aging. The beacon frequency (70.088 MHz) was chosen at very low edge of the assigned band, so as to minimize interference to those operating on the lowest of the three available 25-kHz slots (centered around 70.100 MHz, 70.200 MHz and 70.300 MHz). If you tune your receiver on 70.088 MHz USB, the key-up frequency will so be zero-beated, and you will then hear the CW message with a pitch of 500 Hz. If you wish to see the beacon and the antenna click here. The 70-MHz reception reports received so far are shown here. The 6-meter band is my favorite one. It is really very hard, and one must really spend a lot of time to obtain good results. To reach the DXCC score you can see in my 6-meter DX log, it took me more almost seventeen years. Italian amateurs were granted the 6-meter band in 1990, but they were only allowed to operate over a 12.5 KHz segment (yes, twelve dot five!!) across 50.155 MHz. With such a narrow allocation it was impossible to even think of an Italian beacon. In 1995 I built a beacon operating on 50.004 MHz and, with the help of Pino I0DUD (now SK), I installed it at the Vatican City station HV3SJ. The Vatican is a separate state, so no authorization from Italian authorities was required. 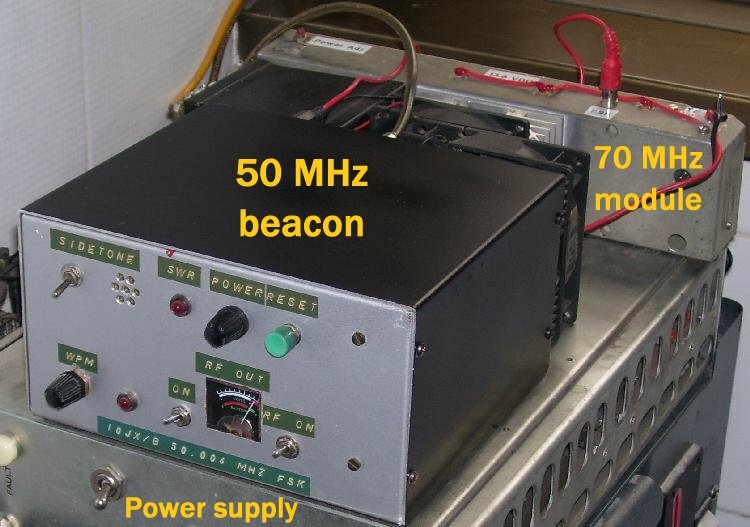 Eventually, the Italian Communications Ministry extended the 6-meter amateur radio allocation to a full MHz (from 50.000 MHz to 51.000 MHz), though still on secondary basis (military forces are the primary users), this making a truly Italian beacon project feasible. By that time the Jesuits decided to close down the historical HV3SJ station, and the beacon then had to cease operating from that QTH. Then I asked our Ministry a permit for operating the beacon over the Italian territory. They gave me the permit but not an ad-hoc callsign, so I had to use mine. The beacon started operations with call I0JX on May 8th 1998. * Equipment: home made (by I0JX). FSK-shifted crystal oscillator at 25.002 MHz followed by a times-2 multiplier, then by two driver stages, and finally by a power amplifier. A feedback circuit keeps RF output power constant independently of temperature variations and components aging. 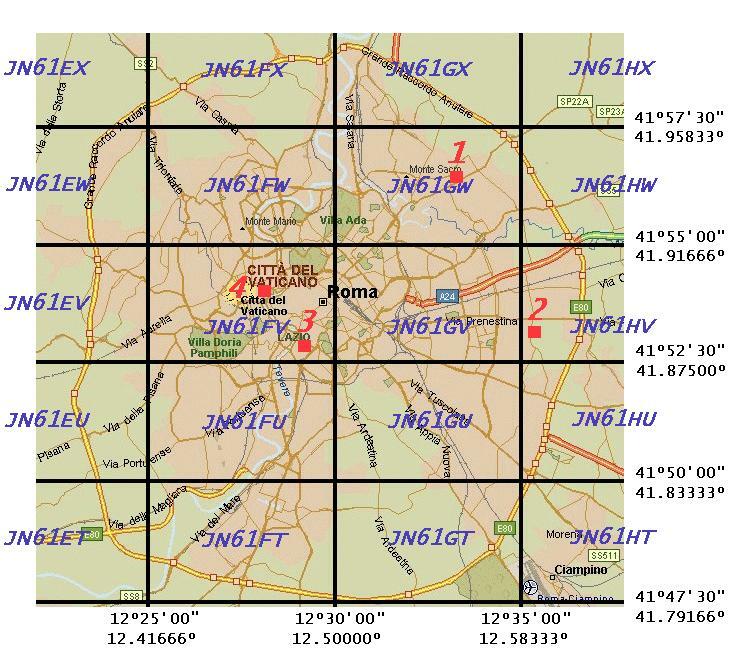 Selecting the beacon frequency (50.004 MHz) very close to the lower edge of the band was mainly driven by the wish to minimize interference to local hams (the beacon is located within the Rome beltway). Care was taken to properly shape the output waveform, for reducing keying clicks and hence interference to the adjacent Region-1 beacons. Hear how 7Q7SIX at 50.0025 MHz and ZS2SIX at 50.005 MHz are copied at my QTH (the antenna heading for Africa almost coincides with that for the beacon). The beacon is built within a plain aluminum box, see picture below. Nothing really special, but it works fine since many years. The internal keyer, utilizing a 27C16 EPROM clocked by a NE555, also controls the 4-meter beacon, which actually is a modified RF module I found in the surplus market. The 50 A DC switching power supply is also surplus. 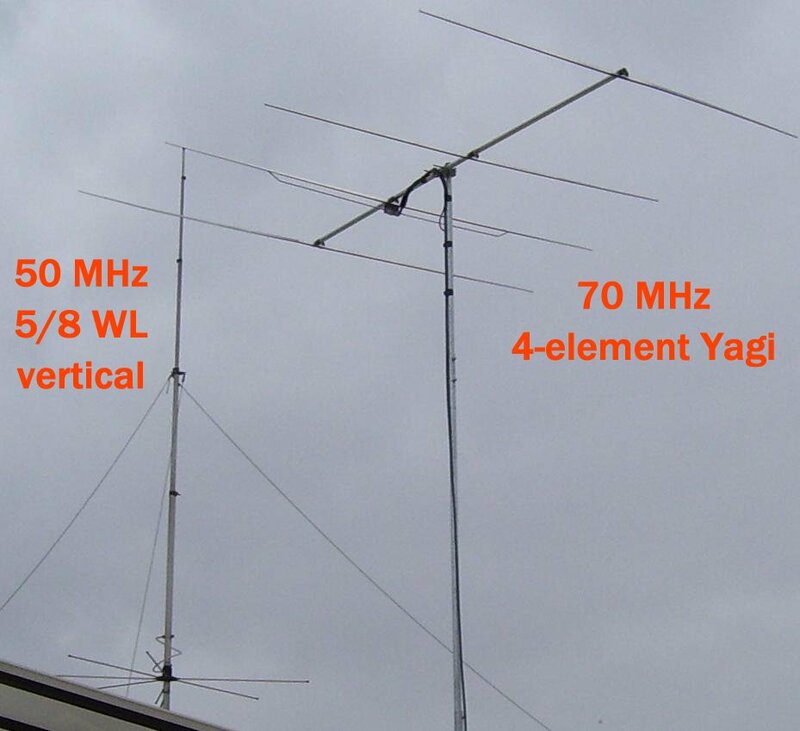 Picture below shows the 6-meter 5/8-wavelength vertical and the 4-element Yagi of the 4-meter beacon pointing: 340 deg. After more than ten years from the first I0JX/B activation, Italian 50-MHz beacons (both personal and club) are now growing like mushrooms. Many of those beacons are of scarce value as they are located too close to each other. Moreover the operating frequency is often selected with little regard to whether the beacon interferes others. Personal ego prevails over general interest. Our radio amateur Leagues apparently show little interest for the 6-meter beacons and let things go as they go. I have received many reports from most European countries (including JX), and some QSL cards too. Outside of Europe, beacon reception was so far reported from CN, D4, EA8, ET, FR, HZ, K (west coast), KH6, LU, OD, PY, TR, TZ, ZC4, ZD8, ZS (including the tough ZS1), 3C, 4X, 5B and 5T.